If you’re deep into the Retro Video Gaming scene you already know of these big three upcoming Sega Mega Drive (Genesis) games. All of which might see a release date in 2018. What is particularly exciting about these ‘big three’ games is despite being created by small Indie teams they are all oozing with massive amounts of potential. 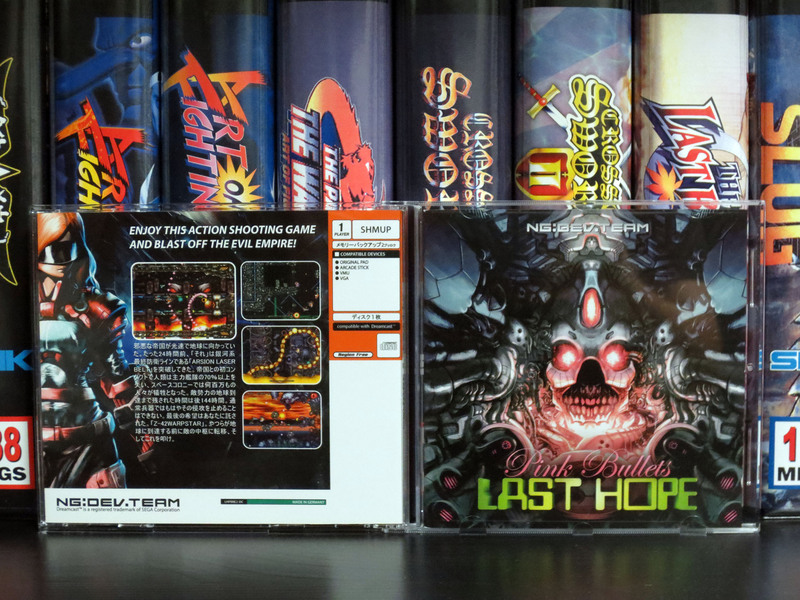 To the point where (when released) each title might rival the caliber of some of the best games ever put on cartridge for the Sega Mega Drive and Sega Genesis. In 2018 to even come close to creating software comparable to the quality of games created in the 1990’s for Sega’s 16-bit game console that had the benefit of larger development teams and industry leading corporations at the helm is a tremendous achievement. Even now, these three games in their unfinished states display seriously impressive talent and expertise of the 16-bit era that has somehow not been lost in time. As a result hardware that is nearing 30 years old is threatening to stay relevant. The mobile telecom world should take note. To be painfully clear; these video games that I’m talking about will be released on physical cartridges that will plug into your old Sega Mega Drive (and Sega Genesis) home video game console so that you can play them just like you did in the 1990’s. What are these big three that are currently rocking the very foundation of the Retro Video Gaming Community? 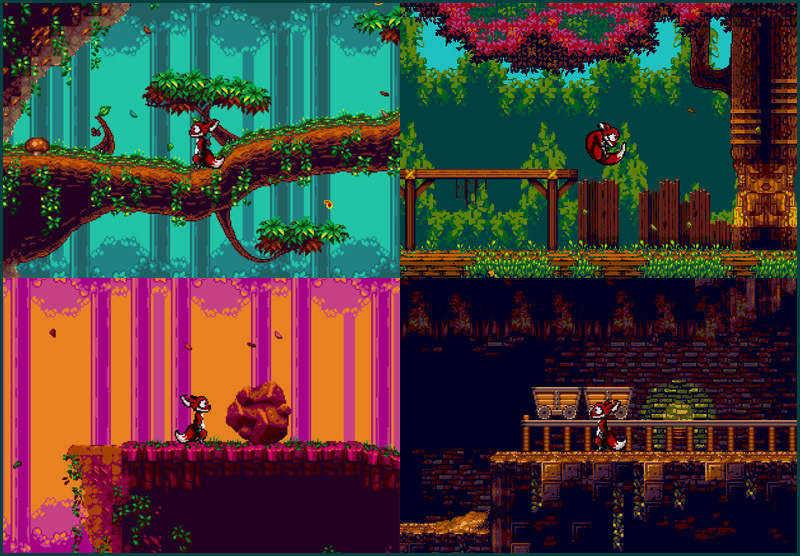 Tanglewood is currently under development by Matt Phillips who is the primary brain behind the project. 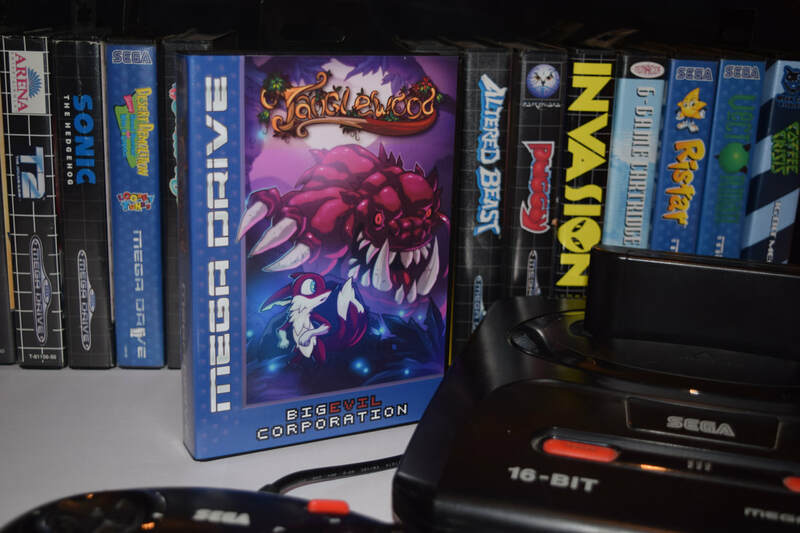 “TANGLEWOOD®​ is a brand new and original game for the SEGA Mega Drive, to be released on physical cartridge in spring 2018. The games creator Matt Phillips was recently interviewed by Chris Foxx from BBC. The video below is an informative piece which offers a unique peek behind the curtain of this very niche project. Even though Matt has soundly earned the title ‘Lone Wolf’ because of how much of the Tanglewood project rests on his shoulders he is getting some help. Below is a preliminary (and wonderful) design of the games cover art for Tanglewood. The artwork of Nymn and the beast was created by the very talented artist Luis Martins; also known as XGoldenboyX around the web. Its details like actual gameplay footage and the connecting and collaboration of great talent that builds a very strong impression that the final product will deliver on what has been promised. Which I believe will culminate in a professionally developed and fun video game suitable for the 1990’s through to 2018 and beyond. *If you can’t wait for release Tanglewood has a playable demo. 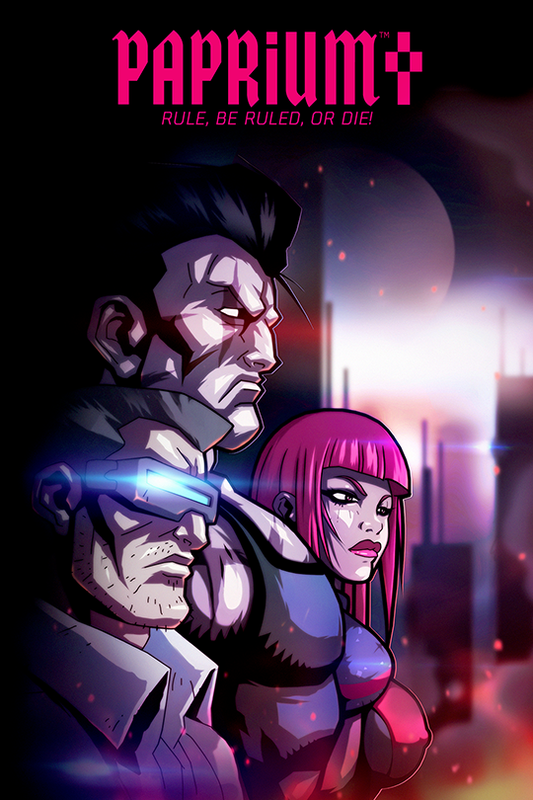 Formed in 2016 Bitmap Bureau is a small development team made up of at least five contributing members to the Xeno Crisis project. 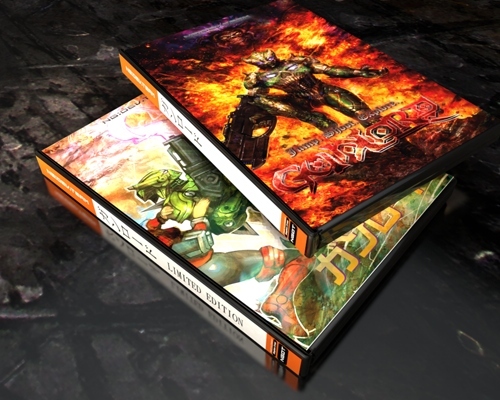 Even though Xeno Crisis will be their first fully realized game for the Sega Mega Drive (and Genesis) they are an experienced team with over 100 completed projects under their collective belts. And just like Tanglewood, Xeno Crisis seems to be delivering exactly what we need to keep interest and faith in what’s being advertised. 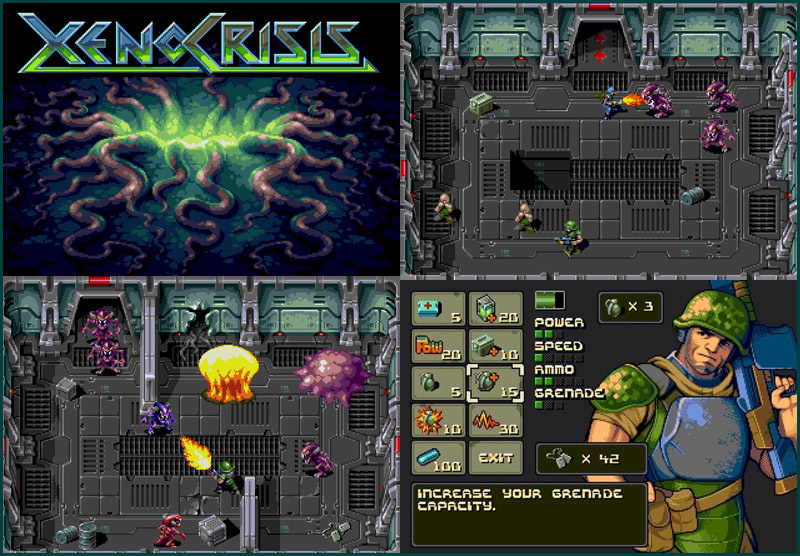 We see talented team members with the right skills showing us tangible gameplay footage of Xeno Crisis. And I tell you this… it looks very good. I really, very badly, want to blast me some Xenomorphs! That’s so gross… Blast it! 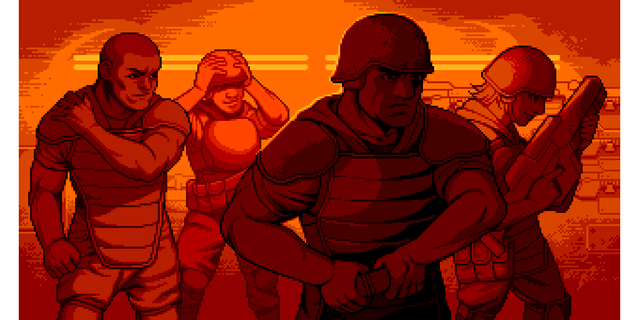 So much of the mystery has been removed making many of us comfortable enough to help fund the development of Xeno Crisis. How many of us? Well to start, the crowd funding for the game drew in 1,289 people raising £72,569 (over $100,000 USD). 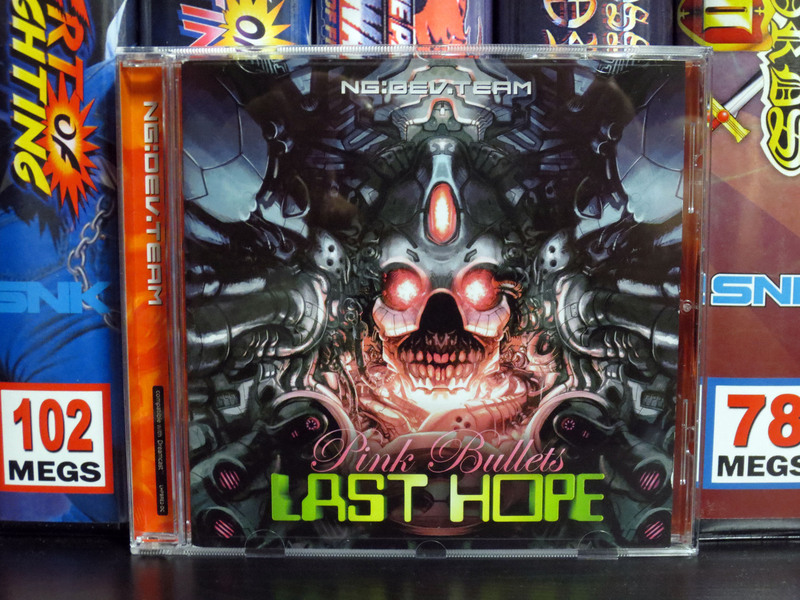 And with regular progress updates from Bitmap Bureau; I’m very excited. Paprium… where to start? Well, that’s part of the problem. We have to start at the beginning. Paprium was first known by its code name Project Y when development began in 2012. It’s now 2018 and the game still has not been released. And to add to the typical anxieties derived from waiting a very long time the lead developer Gwenaël Godde (a.k.a. Fonzie) of WaterMelon Games has almost entirely stopped communicating with the Paprium fan base. To WaterMelon’s credit; when they hit some serious road blocks they did announce them. Once it was reported that their primary development kit was lost by an airline and more recently funds raised for the game had been seized by PayPal. PayPal, we are told, wrongly believed Watermelon had raised too much money for such a small Indie project and fearing some form of fraud froze WaterMelon’s funds. It has also been suggested that too much time has passed between the collection of the money and the completion of the final product that caused the lock-down. But this is all speculation. The end result was a production delay just as manufacturing was about to begin. 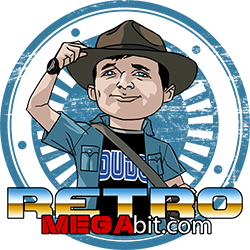 “September 04, 00:00 GMT – Why earning money is not possible for an independent retro game developer ? In 2010, we released Pier Solar, the world’s best selling retro game which shipped to over 40 countries. On the 28th of March, we announced the release of our new 16-Bit game : PAPRIUM, a post-apocalyptic, outrageous, brawler. 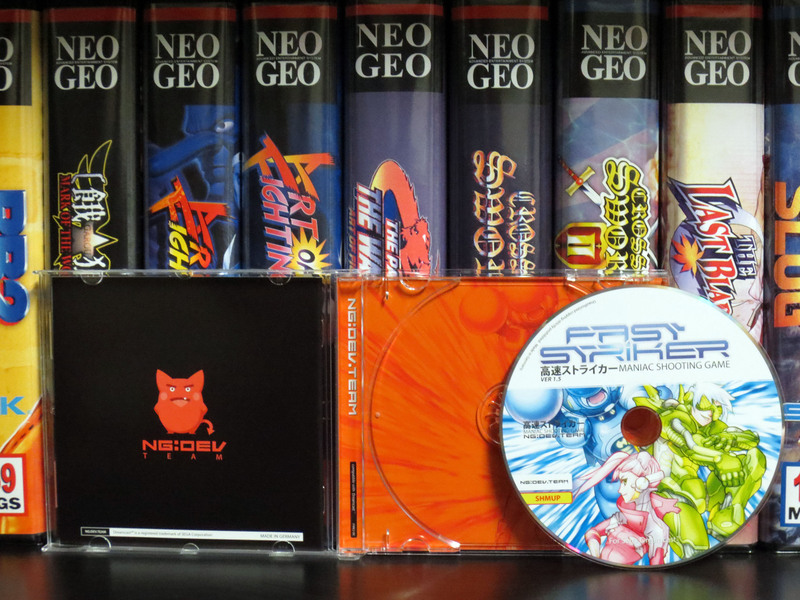 (In the same spirit as Double Dragon, Final Fight & Streets of Rage). This brand new AAA Mega Drive / SEGA Genesis game has been developed from the ground up, to be released in September 2017. 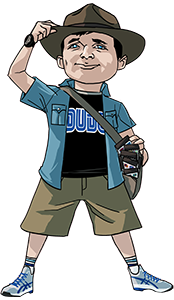 BUT THIS WAS THE INITIAL PLAN… Without acknowledging that – as part of the Indi game industry – we were not suppose to earn too much money by our own ! Within minutes, our fans ordered several thousands games and we will never thanks them enough to be so trustful. However, Paypal, while we had over 8 years of successful business with them, decided to lock our funds ! Why ? are you certainly asking. No reasons were given at first and it took months and two meetings to get one. Reason is “illegitimate business”. An independent game company shouldn’t certainly succeed, especially if it’s about an original cartridge game for a 30 years old game system ! It has now been more than five months, that we opened a battle with them in order to prove by any means that everything is legal, clean. Our fans are real addicts to their Mega Drive / SEGA Genesis, but we are not selling drugs. No avail, they make interests on our funds while we struggle. We decided to continue the production with our own savings… but the amounts required to manufacture such game cartridge, we are talking in millions : the price to pay to get THE perfect cartridge game ! Even if ultimately, we will finally be able to unlock our funds soon but the bad is done ! PAPRIUM will be late and this is all our fans that are extremely disappointed… and we totally understand them. PAPRIUM will rise for earth that Paypal want it or not ! This is actually a detailed and meaningful update. But considering that this update is over 5 months old and almost daily from the time of this update Paprium backers and fans have been asking for more news, any sign of life would have gone a long way to help keep the community calm and relaxed during this final stretch. Did you notice? What you’ve witnessed is a fully realized commercial and not just gameplay footage. Despite a very slow trickle of communications from WaterMelon Games what we do get is usually very polished and impressive. Despite many upset and vocal fans of Paprium I for one am still at ease about this very long wait. I do believe WaterMelon Games is honest and hardworking and at some point we will get this game in our hands. 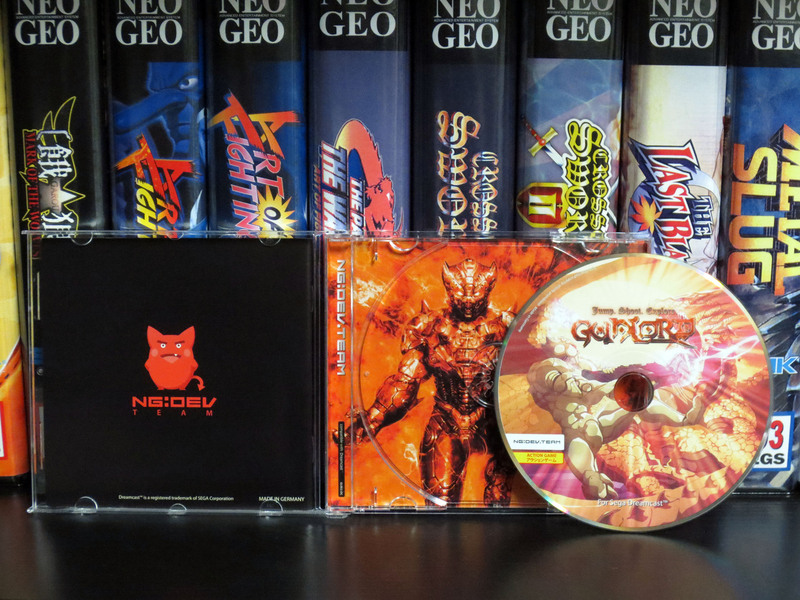 Do you recall the cover art for Tanglewood displayed above? WaterMelon Games is also fortunate enough to have Luis Martins contribute his skill to Paprium as well. Below is the official cover art for Paprium; and it’s brilliant. It’s an example of the all encompassing quality that greatly contributes to the games fit and finish. 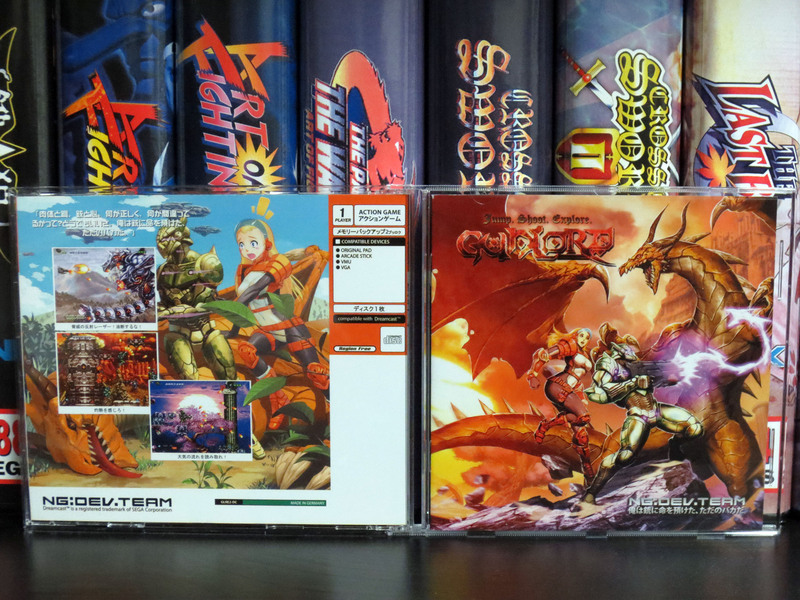 If you’re desperately hungry for Paprium information check out the following interview with Luis Martins on St1ka’s Retro Corner. It’s a long interview that you might not complete in one sitting but it’s full of fine details about Paprium that can’t be found anywhere else. *St1ka is very active in the Retro Video Gaming realm and his content is very informative and enjoyable. Check him out. Will any of these games unequivocally hit AAA status on a 16-bit scale? That’s a very subjective thought. What is easier to speculate on is that when these games are complete I personally feel they will be very enjoyable and worthwhile experiences for both gamers and collectors. Very recently I was fortunate enough to have a nice dialog with Luis Martins about his work with Paprium and Tanglewood. Q1) How did you get involved with the artwork for Paprium and Tanglewood? Luis: At the time I was having a blast collecting for the Sega Genesis. 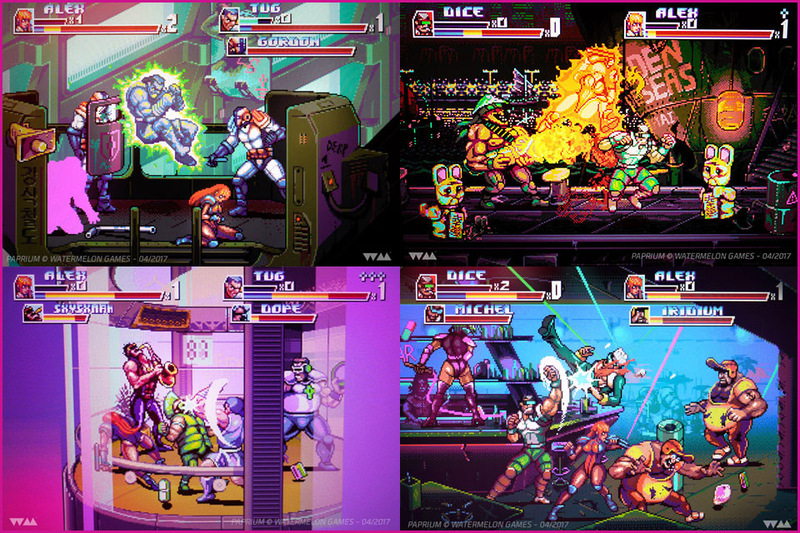 When I heard about Pier Solar , I was impressed and excited that some guys were making a new Sega Genesis game. I decided to contact them and expressed my interest in helping out on any of their future project’s in support for the Retro community. After a great chat with Tulio ( WM president at the time ) and Gwenael (Fonzie) I was introduced to a early idea/ concept for a Beat em UP ( Project Y ). The fun thing was that Beat em Up’s are one of my all time favorite genre’s of games. It matched my art style and love for 80’s 90’s anime and cyber punk. So I was given given green light to join the team. As for Tanglewood, I dint know at the time, but I also contacted Matt to express to him how great of a job he was doing with his Tanglewood game to discover how he also really liked what I was doing with Paprium and my art. So I asked if he was interested in me doing some art for him and he said, sure! ‘What about the games cover art?’ How could I say no to that? 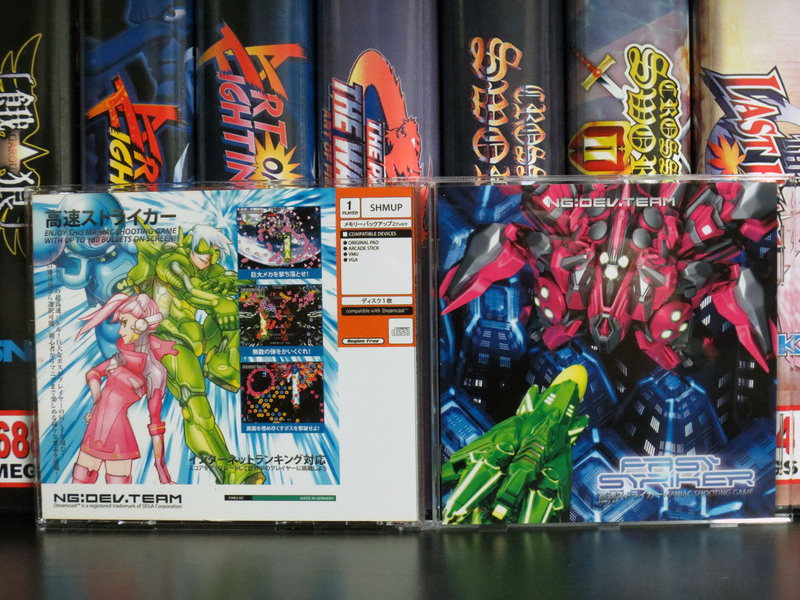 Q2) Where you given any direction or general instructions as to what the covers should look like? Luis: Not really, for Paprium myself and Fonzie where in charge of the character design’s and game’s visuals, so it was easy for me to suggest what I wanted to do for the game’s cover. Fonzie agreed that we should have all 3 characters on the cover and I then started conceptualizing and ended up proposing the now final piece. As for Tanglewood, Matt and I worked together in conceptualizing the final version. But it was simple, Matt knew what he wanted to see for his cover. Q3) Where did your inspiration and ideas come from for each? Luis: For Parpium I wanted to showcase a close up of our heroes, it was important for me to showcase them. After all they are the focus of our adventure. Tanglewood, I wanted to give the feeling of what the game was like, a bit of mystery and horror. You can tell by the main character hiding away from the monster on the cover and running away from him in the game. Q4) Personally I feel the work you’ve done is wonderful. But in a perfect world with unlimited time do you feel there is anything you would want to add or maybe have done differently? Luis: Haha! At the moment no, maybe in a few years I will say how I could have improved this or that. But for now I’m happy with the art. Q5) Are you still playing retro video games? What’s the retro game that you’ve most recently spent some time playing? Luis: “Oh my Car!” Ha ha! Yes, I still play tons of Retro gaming. I’m on the PS4 and Switch bandwagon, I also owned almost all of the consoles, but those that I kept and play are the Gameboy, Super Nintendo, Genesis, Dreamcast, PSP, PSX, PS2, PS3, XBOX and Wii U. And tons of arcade games using MAME. Q6) Are you currently working on any upcoming projects that are looking to become a physical release for a retro home console? Luis: Yes, I’m working to come up with something in the coming years. In the meantime, Paprium is my focus but helping out other Indy dev’s with art is also something I’m really enjoying right now. Q7) I know you’ve done some play testing for Paprium. At that time and in the games unfinished state how good of a game do you feel Paprium is going to be? Luis: As good as the best beat em up’s and especially good the fact that it’s running on a Sega Genesis. Q8) Do you have any idea of the current state of Paprium? Is the software compete? Are the physical components currently being manufactured? If you just don’t know what’s your best guess? Luis: From what I was told Fonzie is putting everything together. 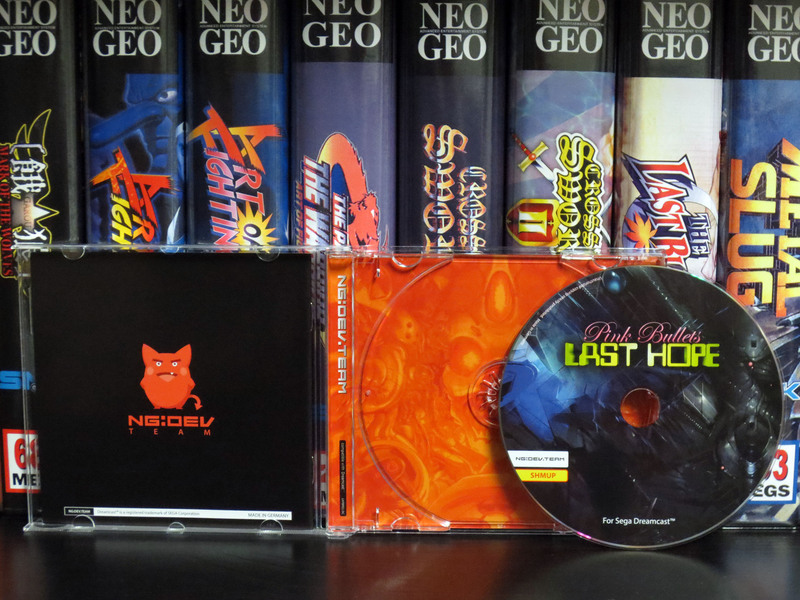 Q9) Do you plan on getting yourself a copy of Paprium, Tanglewood and or Xeno Crisis once they release? Luis: Of course, Paprium I will have more then one copy of the game lol. 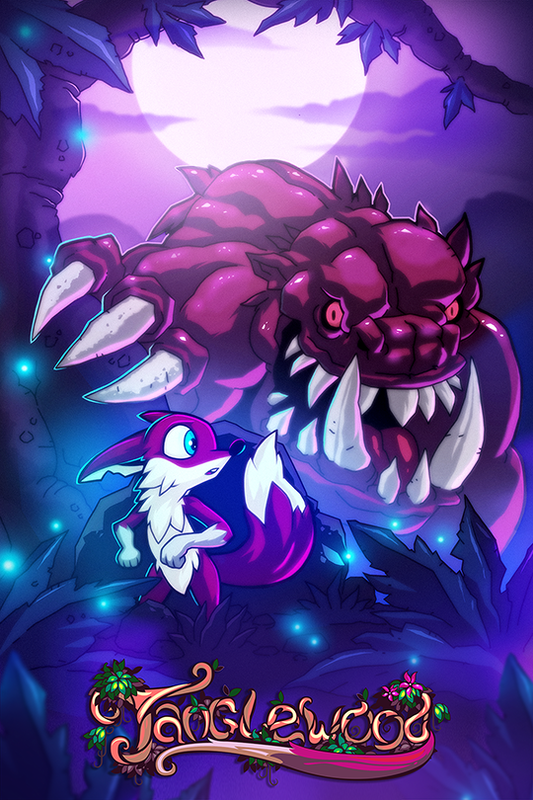 Tanglewood, I’m hoping Matt will send me a copy of his game, really looking forward to it and Xeno Crisis I supported the Kickstarter so I will get that one as well. Luis: Well, I cant comment for other people or on Fonzie. I have spoken openly at times not being happy about the lack of shared information or progress on the game. I always wanted to share more WIP, images, etc, but in the end it’s WaterMelon‘s decision. Obviously Fonzie is in a position where he has experience in putting a game together; software and manufacturing. But that said, people have the right to express what they feel about Fonzie, myself or anything related to WaterMelon especially if you have invested in it. It’s only normal. Q11) Finally, I’d love to hear what you’re working on right now Luis. Luis: At the moment I’m helping other Indy developers with art commissions mostly. I’m also helping out @Matteusbeus on Tomb Of Dracula for the Sega Genesis with some art and working on other game ideas, concepts and prototypes. 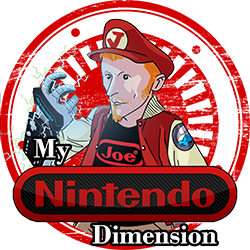 I’m also enjoying doing fan art illustrations on games and anime we like. So more to come this year. Luis Martins is very heavily active in the Retro Video Gaming Community. Both in working directly on many exciting projects and connecting with gamers online. Luis, thank you very much for taking the time to answer these questions! We’re lucky to have you in the Retro Scene. 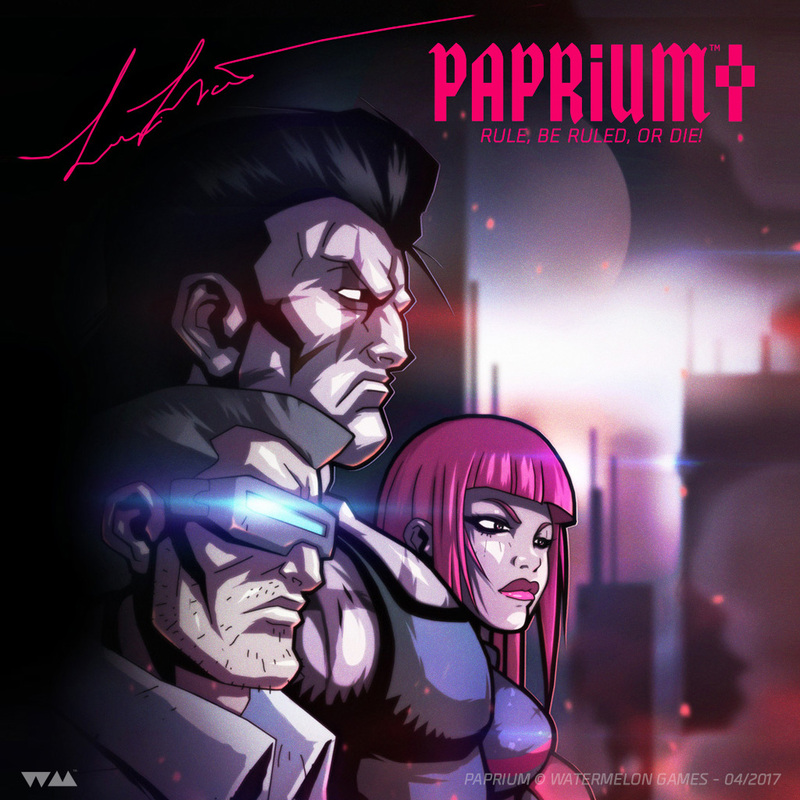 Update 2018/02/22: Luis Martins who on occasion acts as an informal channel of Watermelon Games has given the following update on the current status of Paprium and hints at a release date. Before I wrap up, I want to suggest that anyone contemplating purchasing these games (or any pre-development projects) that you should decide if you’re comfortable pre-ordering/crowding funding and waiting an unknown amount of time before you receive anything in return. Or if it’s better for you to wait until the game exists before putting any money on it. It’s a matter of balancing your tolerance vs. your desire for the product. My stance has always been something like “Wow! I can’t believe people are still making games for the Sega Genesis and Mega Drive!”. I’m all in and I really want to support this trend. *Update: Tanglewood is now available for pre-order See above link. And that is what Street Tough Brawlers, Lean Mean Marines and a ‘fox like’ creature named Nymn have in common. Recently while visiting the forums over at racketboy.com I discovered some very exciting news. 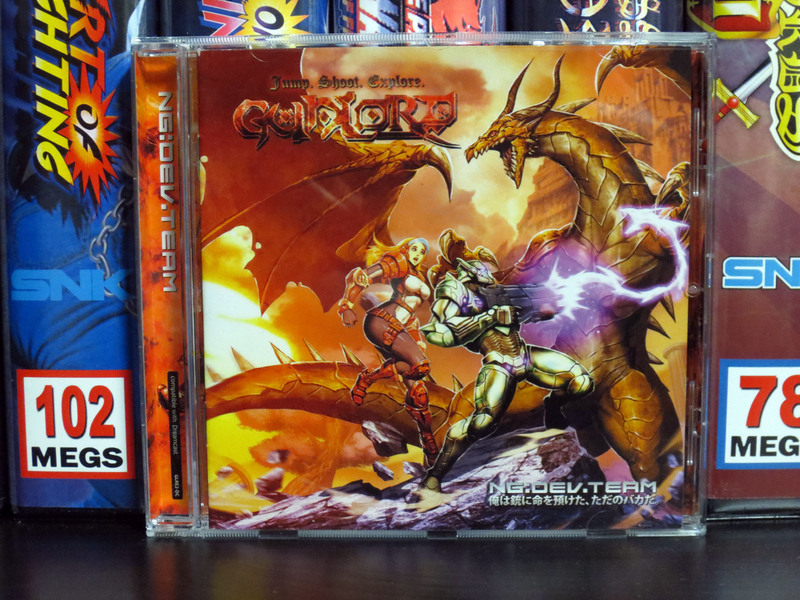 Not only has the wickedly brutal (and awesome) platformer Volgarr the Viking been ported to the Sega Dreamcast but the developers Crazy Viking Studios have declared that the Dreamcast version of Volgarr the Viking is entirely free. 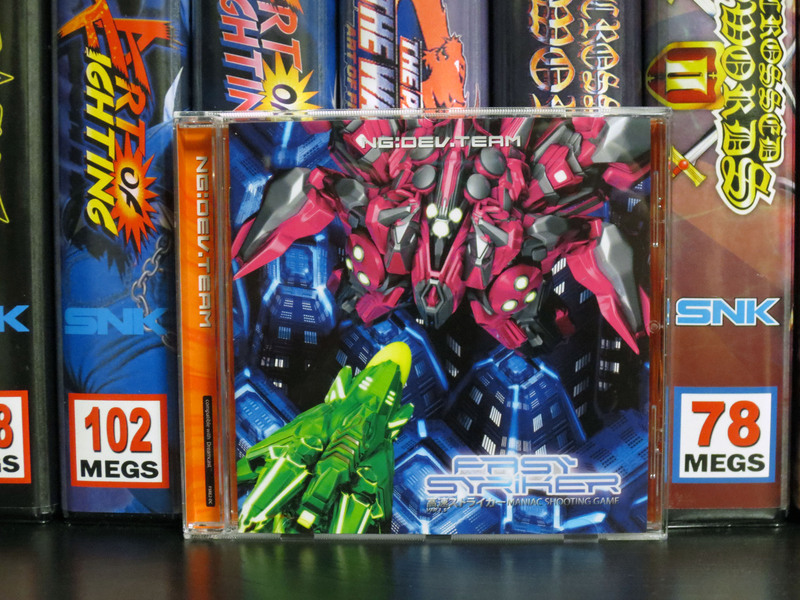 If you have a Sega Dreamcast and a blank CD you can have a legitimate copy of a game that I personally feel is outstanding. I mean really outstanding. This game is one of the most challenging games I have ever play while at the same time it is wildly fun despite countless deaths! Very tight and responsive controls make you one with Volgarr. Every brilliantly executed double jump, spear throw and downward stab is a victory crafted by you. …you’ll also feel entirely responsible every time Volgarr explodes into a cloud of guts and bones. When I first tried out this version my Dreamcast was hooked up to an older 50″ 720p DLP TV. My first impression was that the Dreamcast controller wasn’t quite as good as my PC Logitech controller. Then when I moved my Dreamcast over to my CRT TV I noticed that the Dreamcast controller was just fine. What I had been experiencing on the 50″ HD TV was a very small amount of input lag. The only reason I moved to a different TV was so that I could record the above video clip and I’m glad I did it. Volgarr the Viking is very challenging and the input lag would have been the end of me. Compared to the PC version this port is almost perfect. The Dreamcast does have some noticeable load times between check points but they are short and will not at all hurt your enjoyment of the game. The gameplay itself is identical. The Sega Dreamcast is an excellent place to experience this really well made game. A big ‘Thank You!’ to Crazy Viking Studios for offering the game for free and to Marc Hall for porting the game to the Dreamcast.